The New LED High-Bay Flood. After almost two years of R &D, our exclusive new LED High-Bay Mogul Base Flood Lamp is ready for the market! LEDs emit heat from the back and require space to adequately ventilate that heat from the lamp assembly. 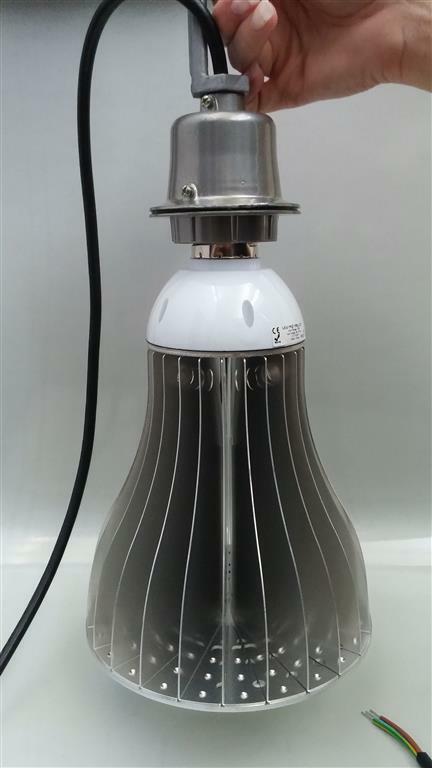 The flaw with many current designs is that the heat rises directly into the driver (usually right above the LED assembly), which dramatically shortens the life of the lamp. Our new design has solved that problem by utilizing large heat fins, and our patent pending driver is one the smallest most efficient LED drivers available. Designed to focus more light where you need it, especially on higher ceilings with down-pointing sockets. Our hook-socket mount is available with any lamp for new installations! This means that now in just minutes, you can now upgrade virtually any compatible fixture to LED at a reasonable cost and will reach your ROI target faster than any other market option. This model is available with clear lens, and with either a 60, 90 or 120 degree output diffuser. This is easily the best choice for schools, municipal or commercial entities looking to enter the LED market with the lowest possible investment. Perfect for upgrading your warehouse lighting to LED, especially when you require more light on the floor! The LivingLED "HBF" High-Bay Flood series utilizes the highest quality Nichia LEDS. *current ballast or power supply supply may require bypass or upgrade (included).